A Canadian province has introduced legislation that would bar civil servants in positions of "authority" from wearing religious symbols at work. The centre-right Coalition Avenir Quebec's bill covers judges, prosecutors, police officers, teachers and some other positions. This is not the first time Quebec has pushed forward legislation to re-enforce state religious neutrality. Several groups are preparing to fight the proposed legislation. Bill 21 will prevent civil servants from wearing symbols such as head coverings like the kippah, turban, hijabs. Civil servants who currently wear religious symbols will be exempt from the bill. The Coalition Avenir Quebec (CAQ) government hopes to pass the legislation by summer. The CAQ was elected last autumn in part on pledges to restrict immigration and impose a secular charter. Opinion polls suggest support for a secular dress code among Quebecers. 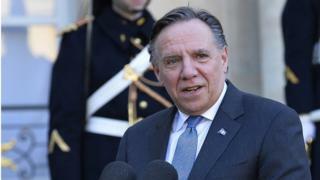 Quebec Premier Francois Legault told reporters the bill "represents our values and it's important." His government issued one compromise on Thursday, tabling a motion that would see the crucifix that hangs in the provincial legislature moved once the bill is passed. It is not yet clear what kind of response the bill might prompt from the federal government, though Prime Minister Justin Trudeau criticised it on Thursday morning. "It is unthinkable to me that in a free society we would legitimising discrimination against citizens based on their religion," he told journalists in Halifax. Who has spoken out against the proposed bill? A teachers labour union has already mounted a legal challenge over questions the provincial government put to a number of school boards and schools related to how many of their employees wore religious symbols at work. The Federation autonome de l'enseignement, which represents some 43,000 educators in the province, said it believed that type of query breached Canada's rights charter. The English Montreal School Board, the largest English public school board in the province, said on Thursday it will not implement the proposed measures. Jewish advocacy group B'Nai Brith called it "an assault on the fundamental rights and freedoms of Quebecers". And the National Council of Canadian Muslims called it "discriminatory legislation". "Under the guise of secularism, this legislation is effectively a prohibition on wearing the hijab in the Quebec public service given the overwhelming number of people impacted will be Muslim women," executive director Ihsaan Gardee said in a statement. That organisation launched the legal challenge against previous provincial Liberal legislation that banned face coverings. That legislation was stayed by a Quebec judge last summer. The group is now weighing its options for Bill 21. The Quebec government is invoking the rarely used "notwithstanding clause" that allows it to override the Canadian Charter of Rights and Freedom for up to five years as a guard against legal challenges. The debate over secularism and religious accommodation has played a significant role in the province's public discourse for over a decade, and this is not the first attempt by a Quebec political party to restrict civil servants from wearing overt religious symbols. In 2014, the Parti Quebecois proposed a so-called Charter of Values, legislation that would have barred public servants from wearing religious symbols and made it mandatory to have one's face uncovered when providing or receiving a government service. In 2017, the provincial Liberals passed more narrowly focused legislation that barred people from wearing face coverings when giving or receiving a public service. Similar legislation is in place in various countries across the European Union. France was the first, passing a ban on veils, crosses and other religious symbols in schools in 2004. It was followed by Belgium, which outlawed any clothing that obscures a person's identity in a public place. Full or partial bans have since been passed in Austria, Bulgaria and Denmark. Can this woman become the first cop in Quebec to wear a hijab?